Born in 1812 in a prosperous London suburb, Edward Lear was one of twelve children to survive past infancy in the Lear family. His father was a successful stockbroker who in 1816 made poor investments that caused him to become bankrupt. Though he was able to make his way out of debt a few months later, the Lear family never enjoyed the same level of wealth that they once had. 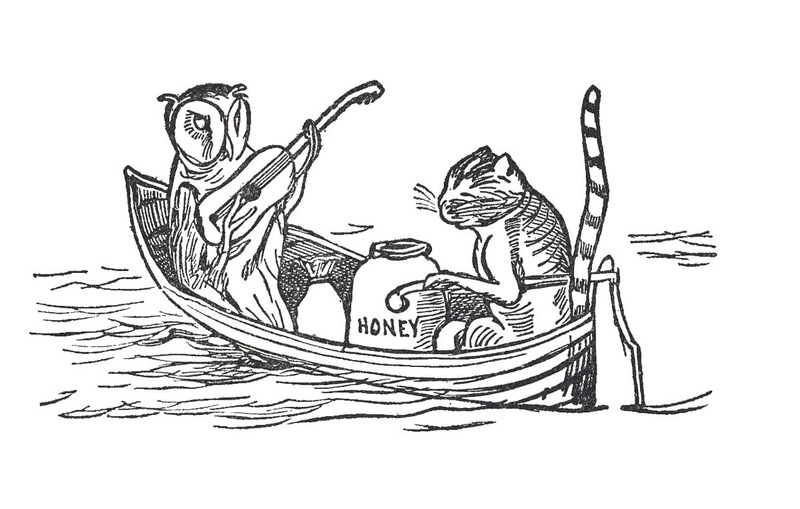 Due to this change in fortune, Edward Lear’s mother felt unable to cope with the number of children that she had, and so she gave Edward to Ann, one of his elder sisters, to be raised. Edward rarely saw his parents from this point on, and his mother no longer played any part in his upbringing. As a result of this traumatic shift in his childhood, and also due to his ill health, Edward was depressed by age seven and continued to struggle with “the Morbids” for the rest of his life. Edward Lear’s constant illnesses were a constant detriment to his livelihood, especially his epileptic attacks which he experienced on a near daily basis. He referred to these seizures as “the Demon” and kept them secret from anyone outside of his family. If he were at a public function and felt a seizure coming on, he would remove himself into a private room so no one would be able to witness the episode. Epilepsy was often associated with demonic possession during the Victorian era, which may explain Edward’s term for his seizures, but also his reason for keeping it secret from almost everyone throughout his life. His epilepsy, as well as his poor eyesight, chronic asthma, and bronchitis forced Edward to lead a very isolated, though active life. From childhood through old age, Edward kept himself on the go and would frequently take long walks in order to attempt to keep his seizures at bay. During his childhood, his closest friend was his sister and guardian, Ann, who shared her love of literature and history with Edward, who developed a passion for poetry, as well as natural history. 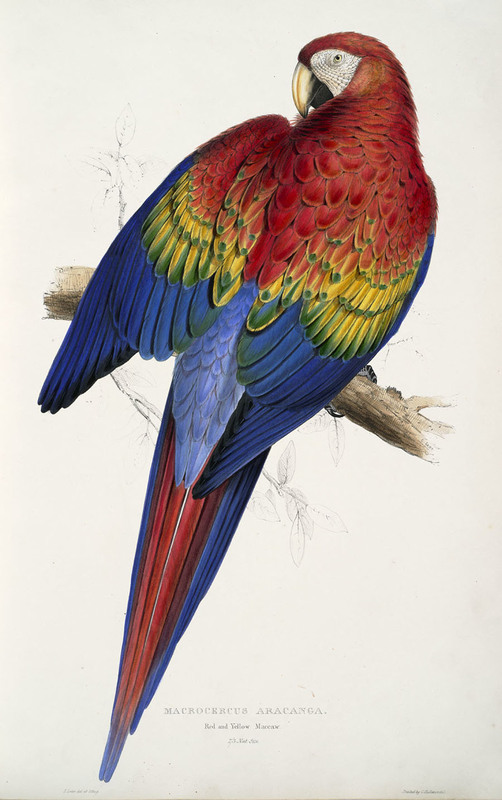 Lear’s book caught the attention of Lord Stanley, heir to the twelfth Earl of Derby, who was looking for an artist to assist him with his plans to publish an illustrated book on his rare collection of birds and animals. Located in Knowsley Hall, near Liverpool, he invited Lear to come and live at the estate so that he could make drawings of the menagerie. This project occupied Lear for the majority of the next five years, and represented a turning point in his personal and professional life. Considered to be part of the Knowsley Hall staff, a twenty year old Lear dined with the staff and servants for meals downstairs, however once the Earl of Derby noticed how quickly the children flocked to Lear after finishing their meals, he invited him to eat with the family and other noble guests upstairs. It was the children at Knowsley Hall that inspired Lear to begin creating his drawings and stories as entertainment, which were soon accompanied by limericks. 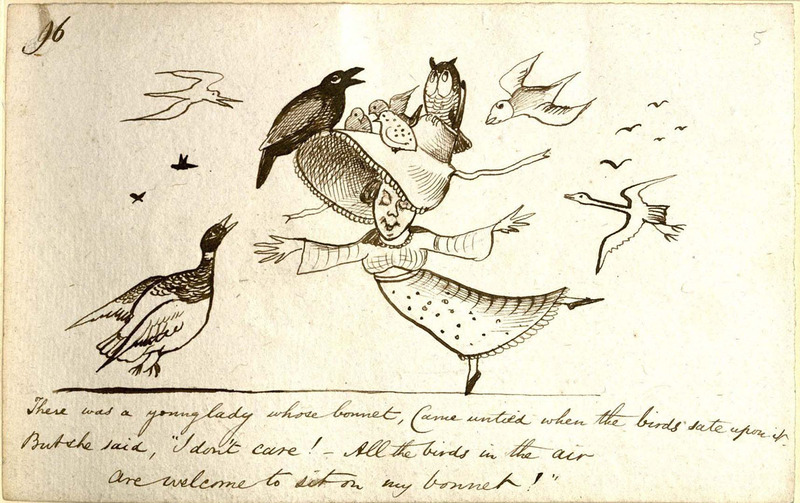 These drawings were whimsical and “the antithesis of his meticulously rendered zoological drawings.”2 He viewed the limerick as “a form of verse lending itself to limitless variety for rhymes and pictures,”3 and began to use them as pairings with his illustrations, poking fun at people and things he found amusing. His work was always intended to make children laugh. In 1837, when Lear was twenty-five, his health declined and the English winters became too much for him to endure. His chronic asthma and bronchitis meant that he had significant trouble tolerating damp weather, so with the help of his friends at Knowsley Hall, he packed his belongings and moved to Rome. In addition to his respiratory health, his eyesight began to deteriorate and he could no longer work as a zoological draftsman, meticulously drawing the details as he once had. 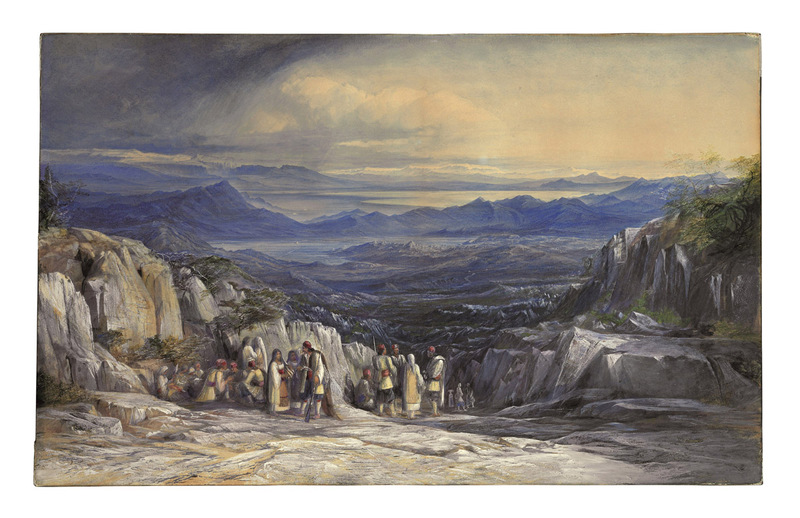 Lear turned to landscape painting and created watercolors and oils of the beautiful places he traveled. He published two books of lithographs from his landscape paintings entitled Views in Rome (1841) and Illustrated Excursions in Italy (1846). This second book greatly impressed Queen Victoria and she invited Lear to the palace for twelve lessons to teach her drawing. While he was traveling, Lear also continued to create limericks and drawings for the children of friends he met along the way. Eventually, Lear collected all of these rhymes to publish in his Book of Nonsense in 1846, twelve years after leaving Knowsley Hall. Four editions were published during Lear’s lifetime, with additional limericks and nonsense added in each one. Though Lear is also remembered for his zoological studies and his landscape painting, his Book of Nonsense series made him a household name and revolutionized children’s literature. Until Lear, children’s books were often saturated with moral undertones with the intent of teaching children how to behave “properly.” Lear merely wanted to amuse children and make them laugh; his work never attempted to insinuate that they should act a certain way. Most of Lear’s fame and fortune during his lifetime was a result of his Book of Nonsense and it’s subsequent editions. His renown as a landscape painter was not realized until the 1920s, when several thousand watercolors from his friends’ estates appeared at sale. As a result, Lear had a newfound posthumous reputation as a painter, which has heightened ever since. From the age of twenty-five when he left England, Lear did not stop traveling. He spent a great deal of time in Europe, but also ventured to Egypt, Palestine, and India. Despite his perpetual travel and his lack of time in his home country, Lear managed to keep in touch with his close friends and family in England by writing letters every day. In 1871, Lear finally decided to end his travels and settle in San Remo, Italy. After his first home, Villa Emily had to be abandoned due to a new hotel blocking his view, Lear built Villa Tennyson in a new location overlooking the Mediterranean. Lear lived in Villa Tennyson until his death in 1888. 1. Susan E. Meyer, A Treasury of the Great Children’s Book Illustrators (New York: Harry N. Abrams, 1987), 52. Bland, David. A History of Book Illustration. Cleveland, OH: The World Publishing Company, 1958. Dalby, Richard. The Golden Age of Children’s Book Illustration. London: Michael O’Mara, 1991. Doyle, Susan, Jaleen Grove, and Whitney Sherman. History of Illustration. New York: Bloomsbury, 2018. Meyer, Susan E. A Treasury of the Great Children’s Book Illustrators. New York: Harry N. Abrams, 1987. Uglow, Jenny. Mr. Lear: A Life of Art and Nonsense. London: Faber, 2017.